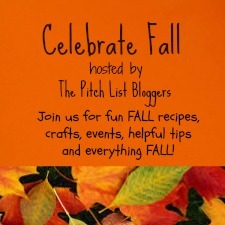 To Celebrate the wonderful Fall Season......a group of excellent bloggers have gotten together to bring you "Celebrate Fall"
"Celebrate Fall" is a blog hop of all different interesting blog post about FALL. We have recipes, green living tips, Halloween projects, Fall DIY decorations and much more. Make sure to check out the event and keep coming back to check out what is new. Bloggers will be adding post from now till Thanksgiving. OH! I really need to get my fall crafts started!